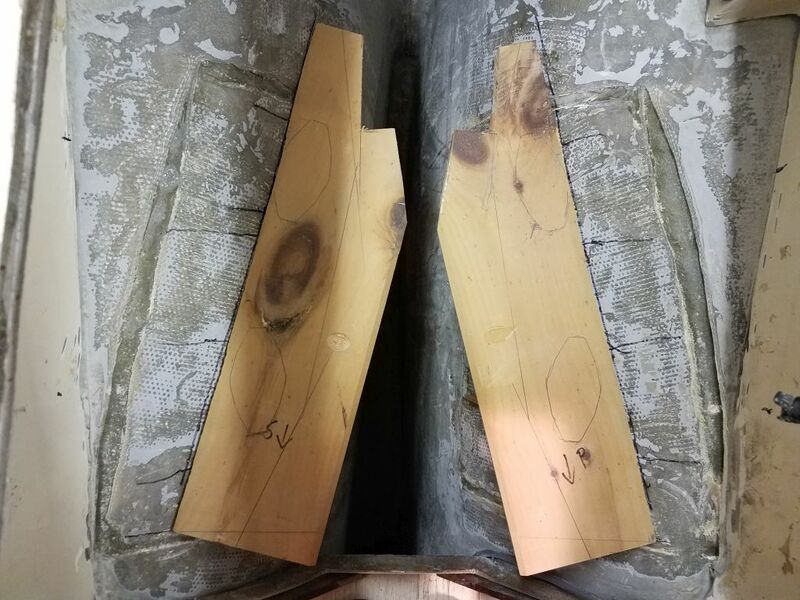 Now that the rough templates for the new engine foundations were in place, and the basic positions of the four flex mounts marked accordingly, I removed the engine template, and used one of the mounts to mark outlines at all four locations, using the rough marks I’d made to align the mounts. 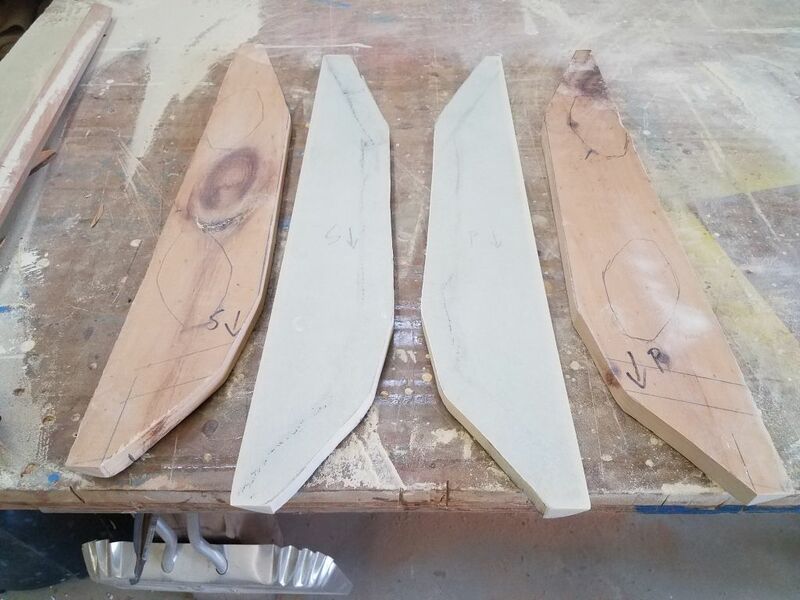 This gave me what I needed to I could plan the final shape and size of the foundation platforms, leaving ample room around the mount bases to allow for position adjustments, while eliminating excess material where possible. 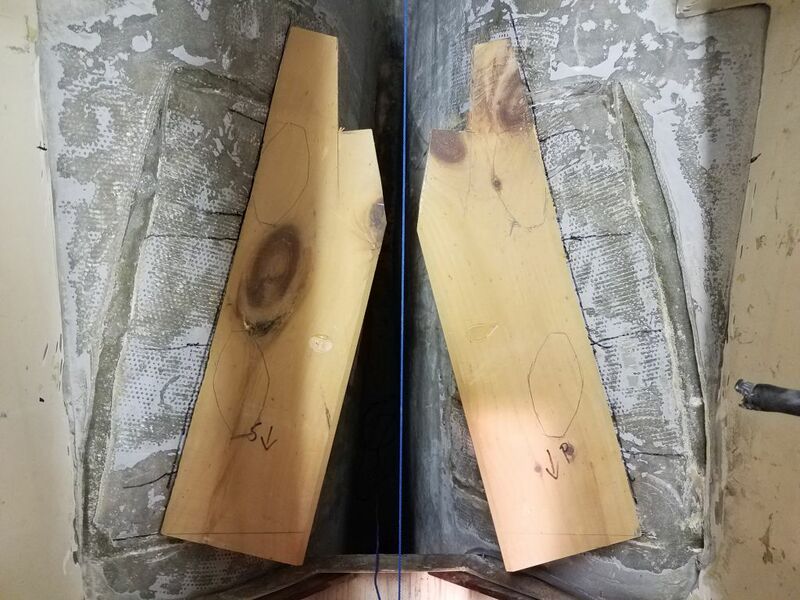 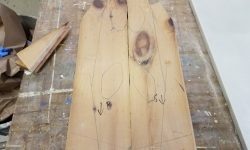 Then, I removed the rough pine templates from the boat and down to the bench so I could prepare the actual pieces. 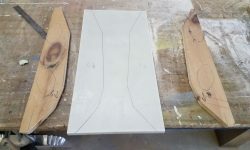 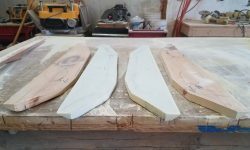 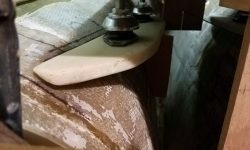 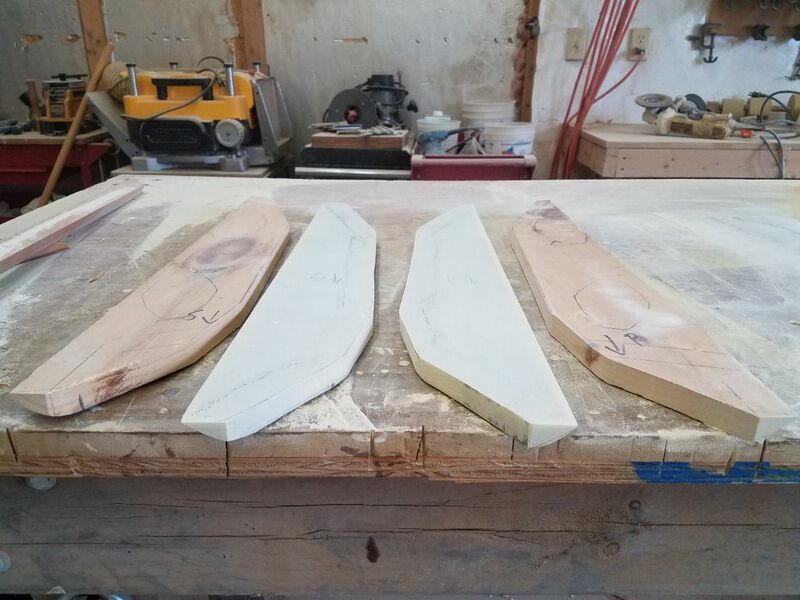 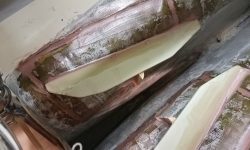 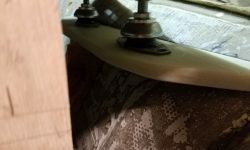 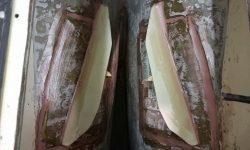 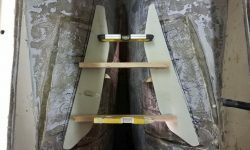 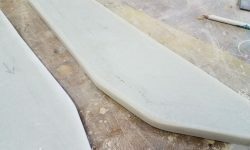 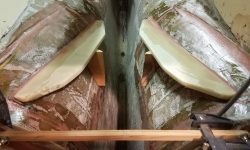 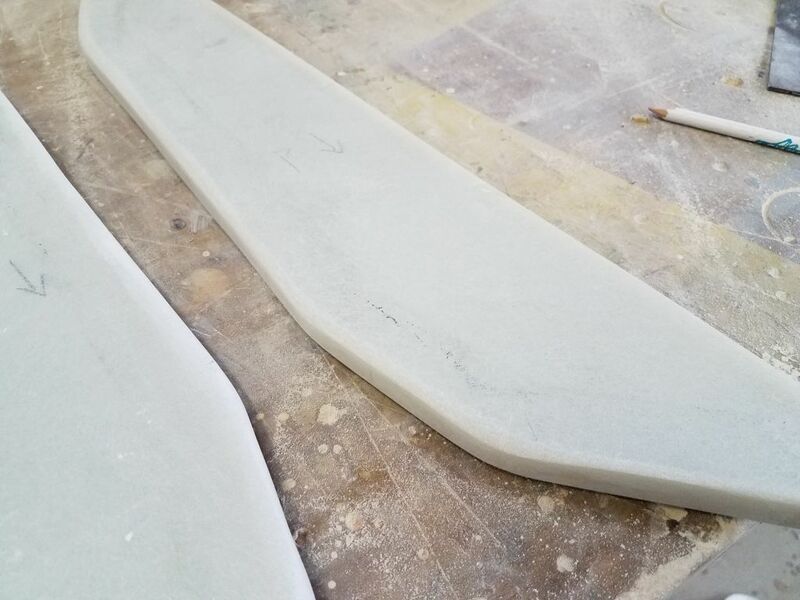 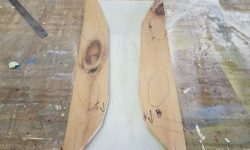 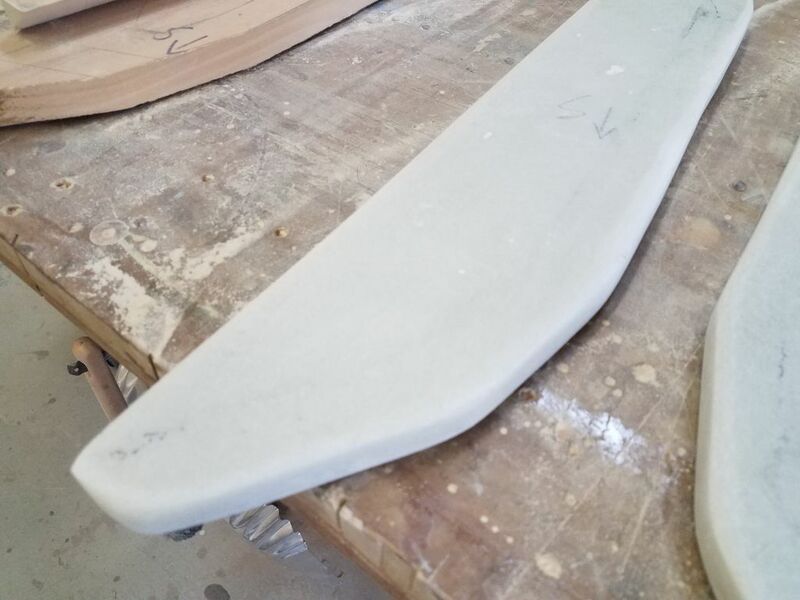 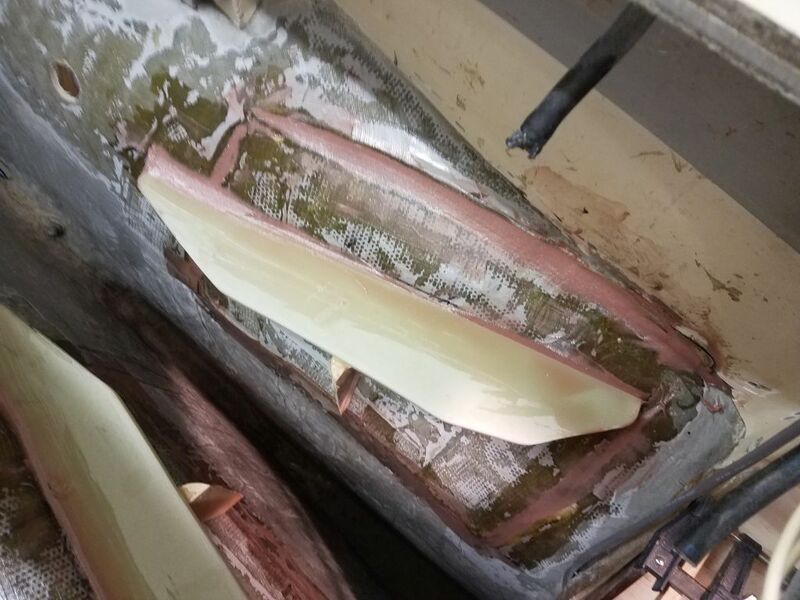 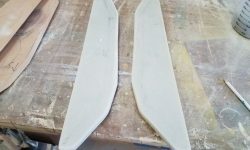 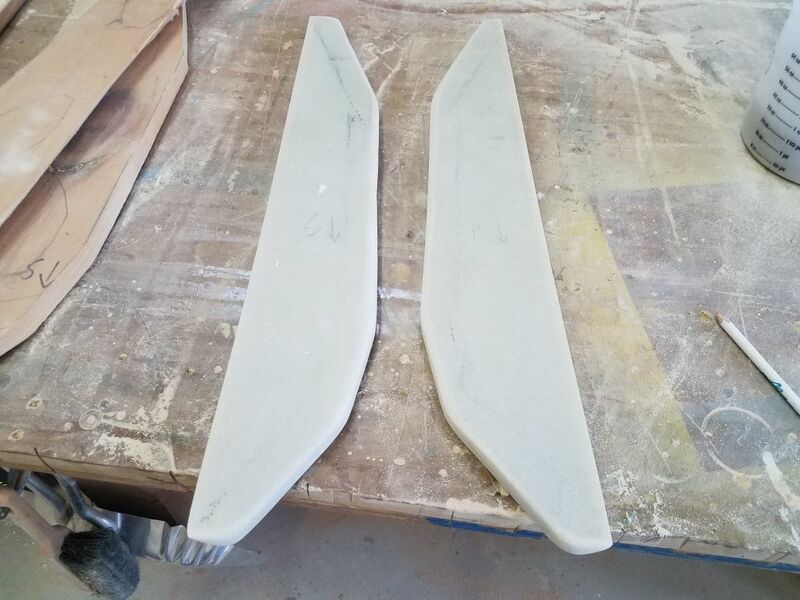 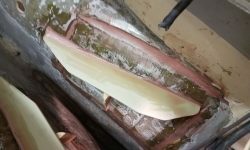 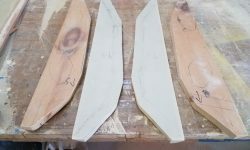 I sanded off the smooth, shiny factory surface from the sheet of 3/4″ G10 I’d purchased for the foundations, then cut out the pine patterns along the marks I’d made earlier, and used these to mark and ultimately cut the fiberglass. 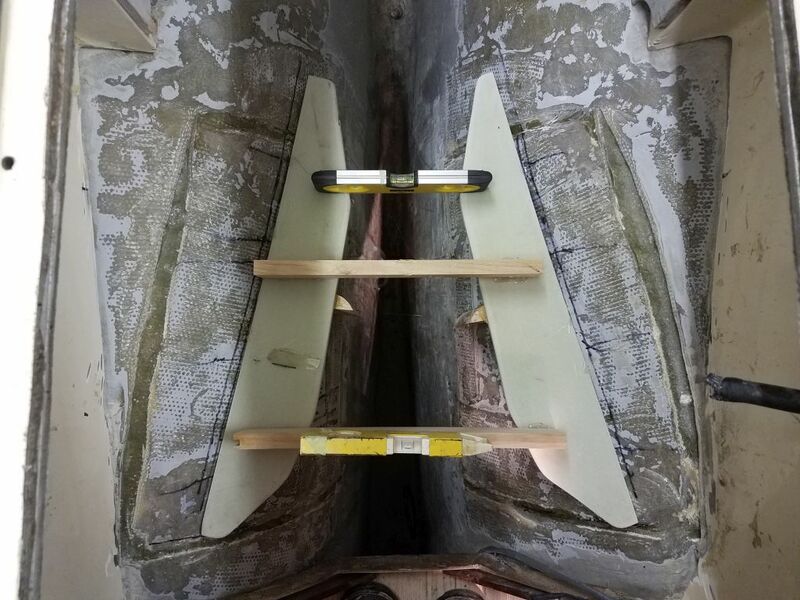 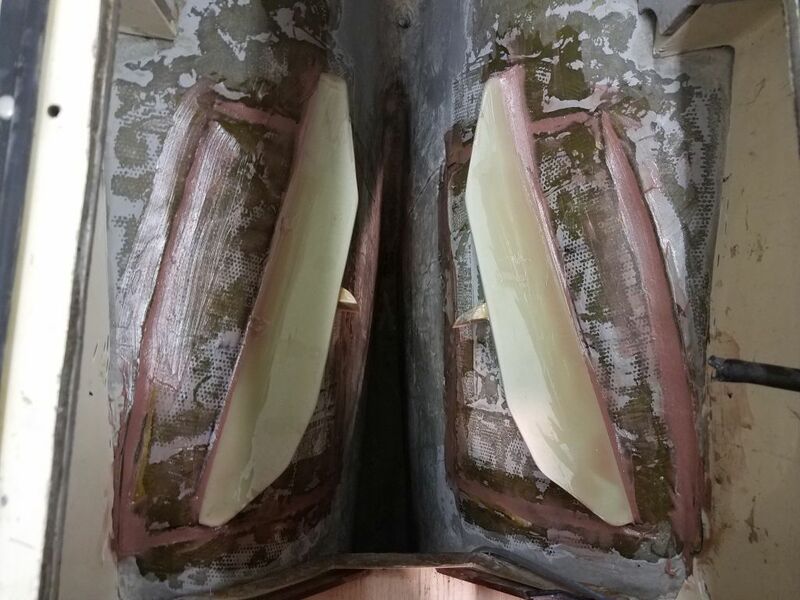 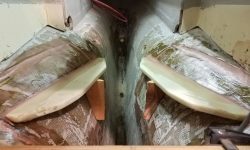 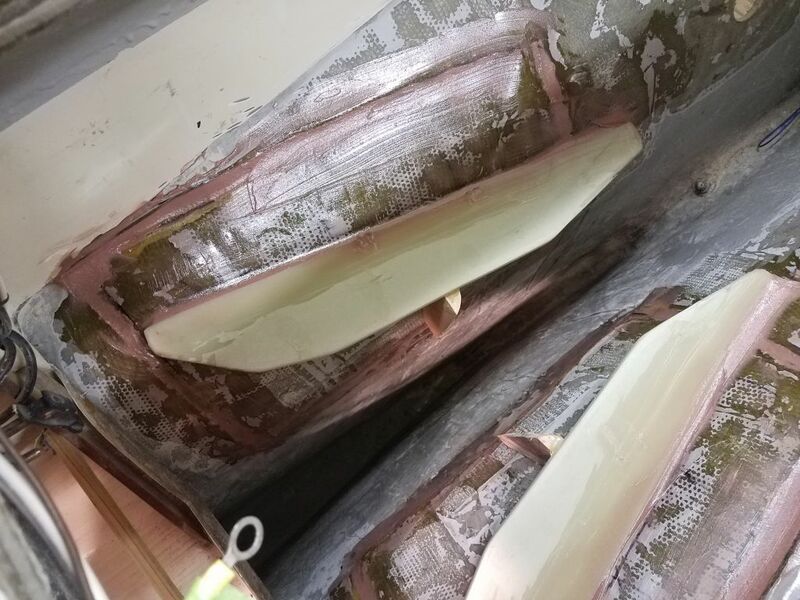 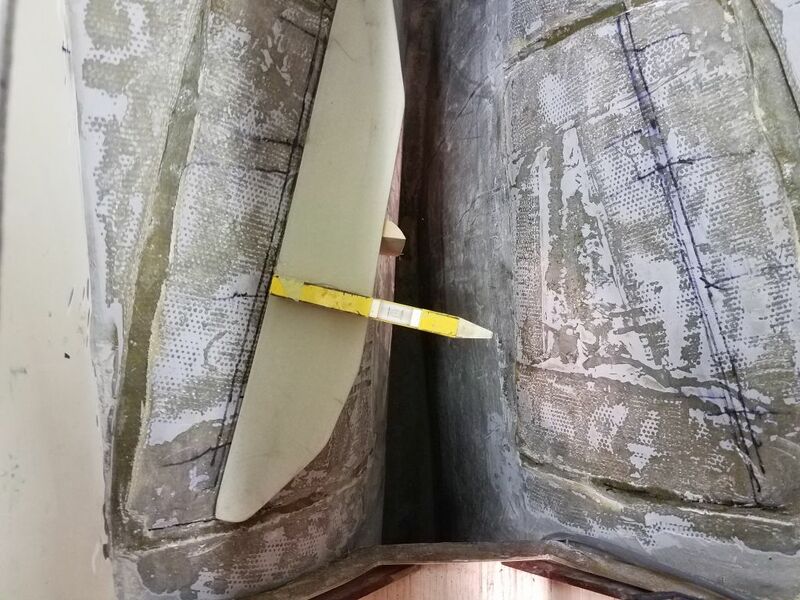 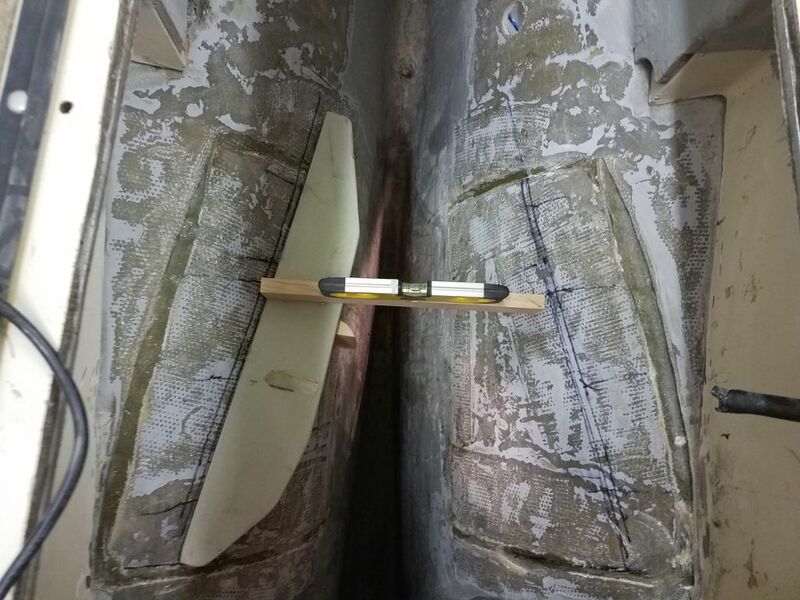 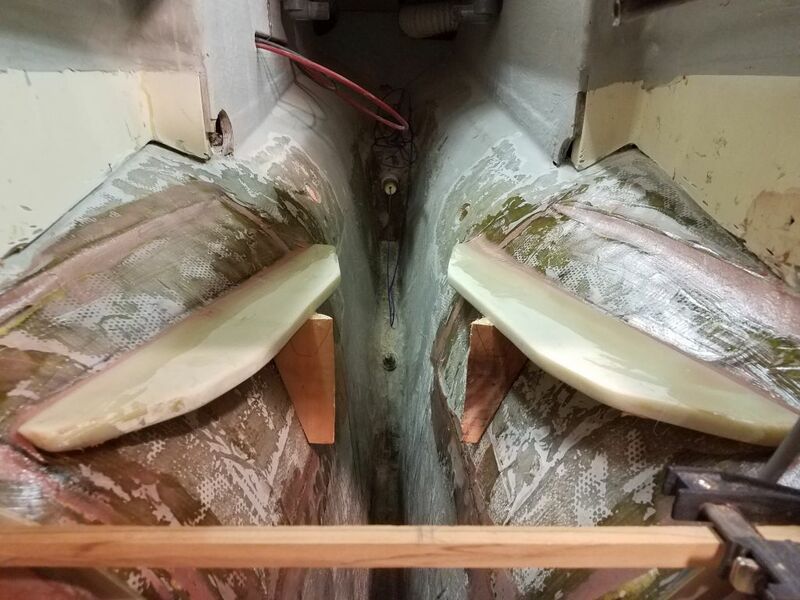 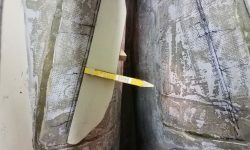 Then, I marked the rough shapes of the bevels on the outboard edges of the foundations, where they met the hull, and shaped these areas as needed. 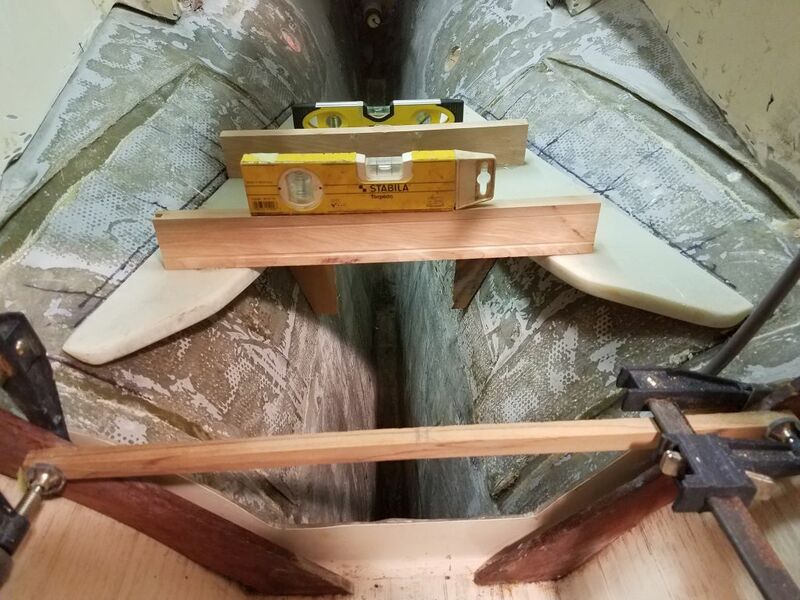 After a test-fit, I cleaned up the cut edges and rounded the edges and corners of the new foundations. 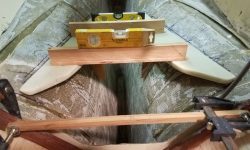 I wanted to be sure that the final foundations didn’t end up any higher than needed; if anything, I preferred they ended up low, since it was easier to add height than deal with an overage. 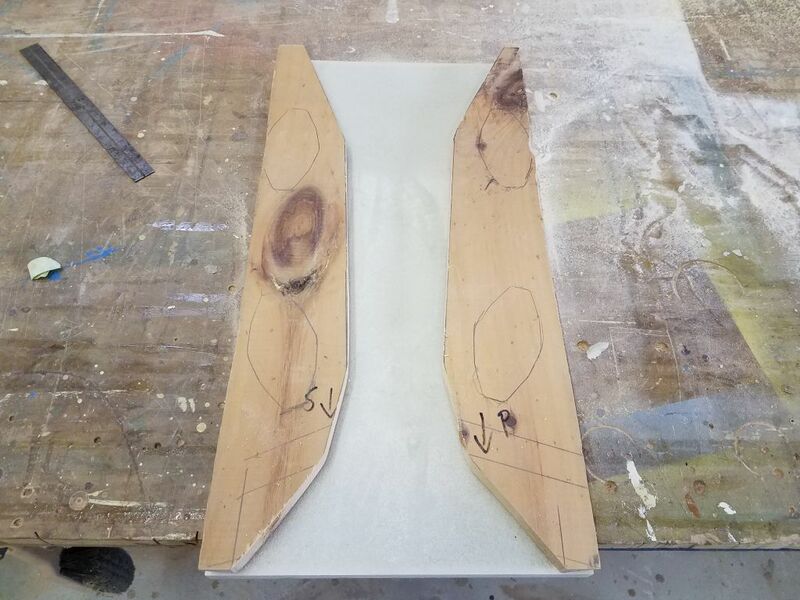 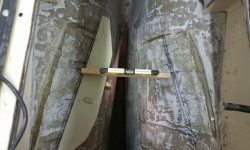 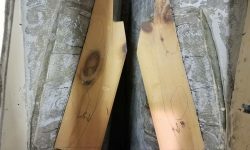 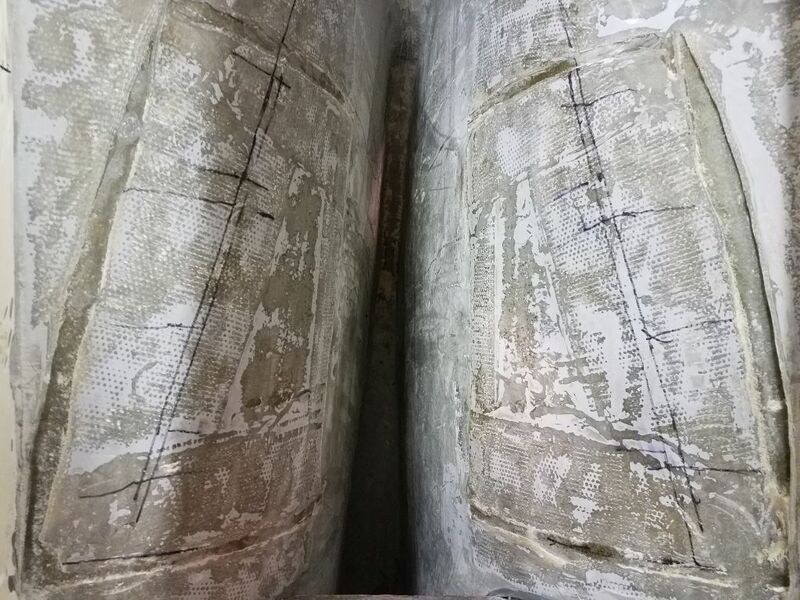 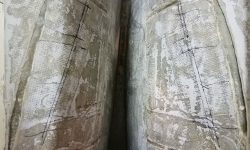 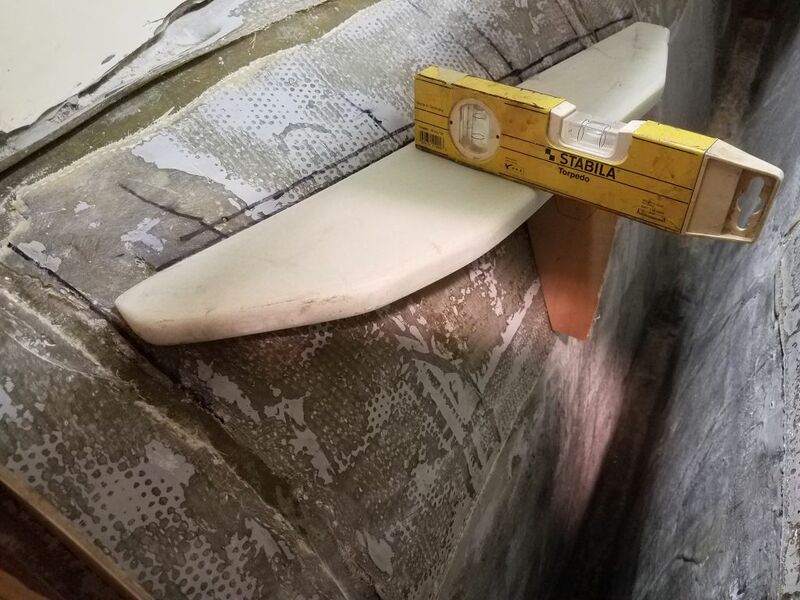 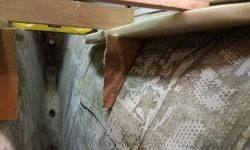 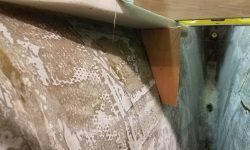 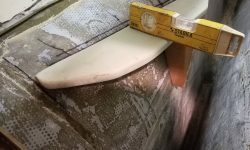 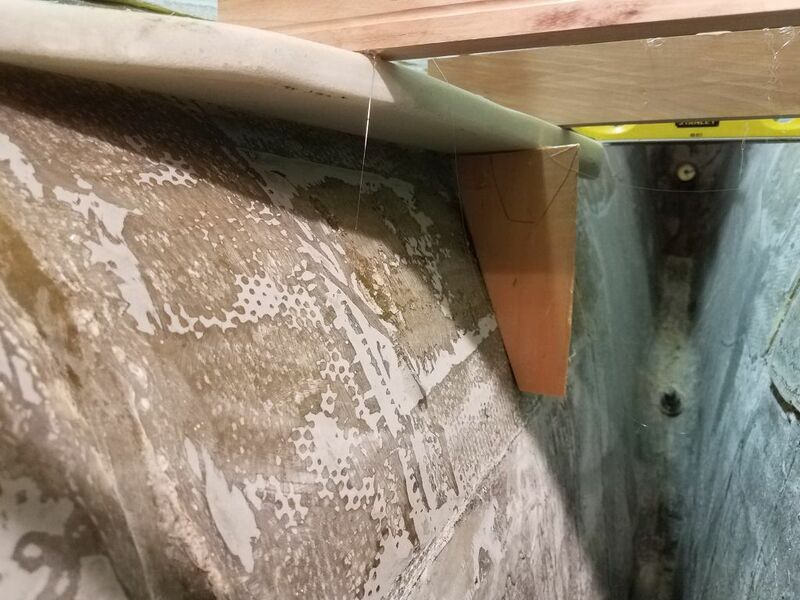 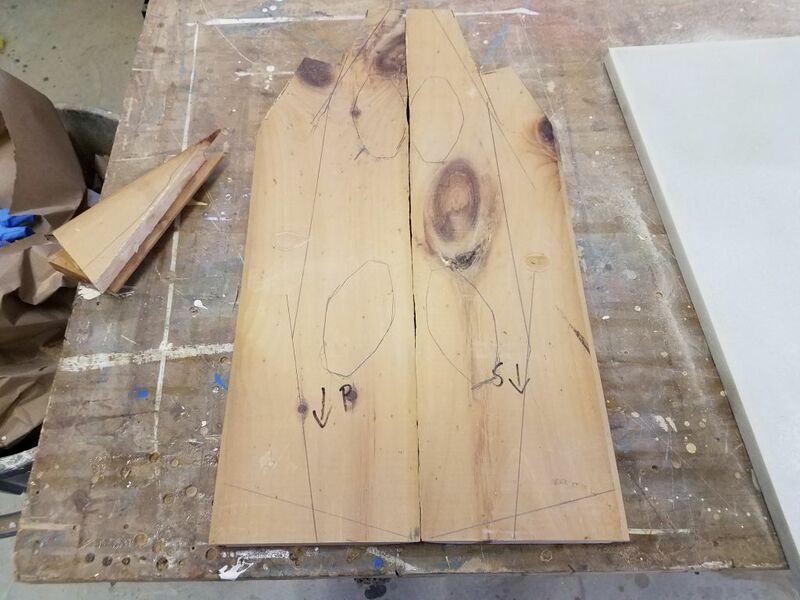 I also had to leave room for the fiberglass tabbing that would ultimately secure the foundations, so I made new reference marks about 1/4″ vertically below the originals, and I’d align the fiberglass foundations with these new marks. 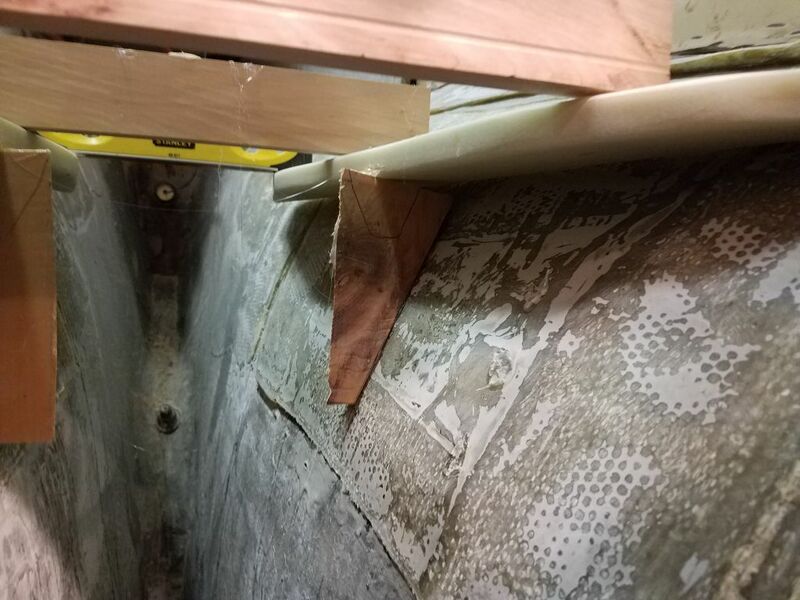 Using a level to ensure side-to-side alignment, I tacked the foundations in place along my reference lines, adding a little support beneath to help support the weight. 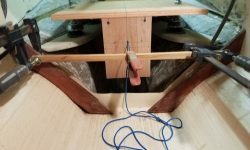 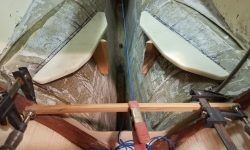 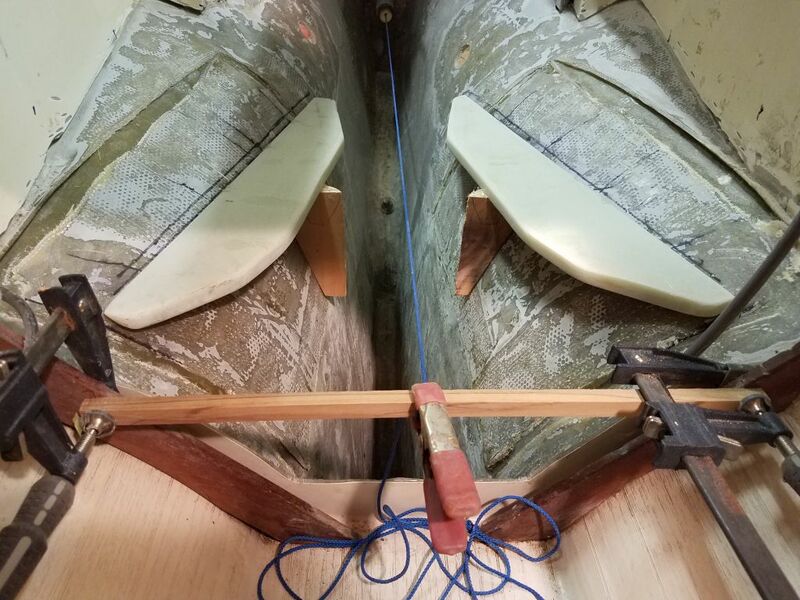 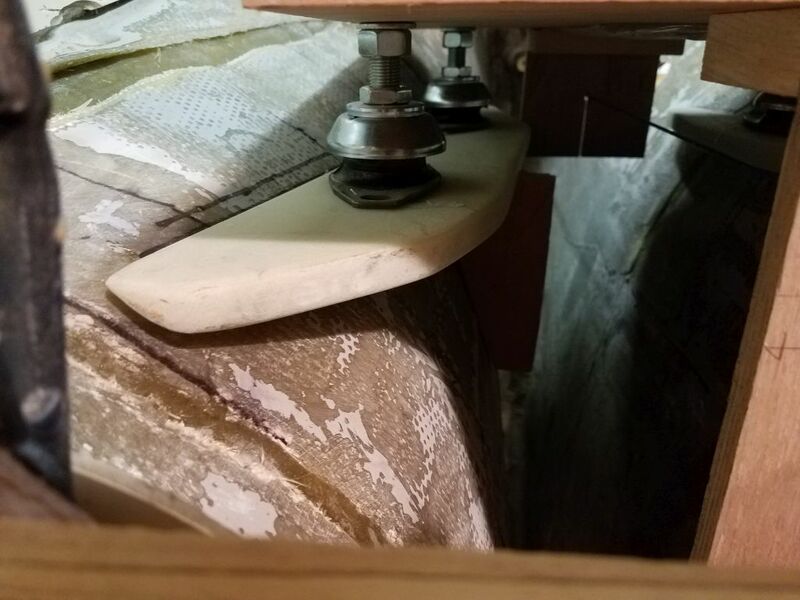 I started with the starboard piece, then, once it was set, prepared level braces across to the other side so I could install the port piece properly according to the first piece. 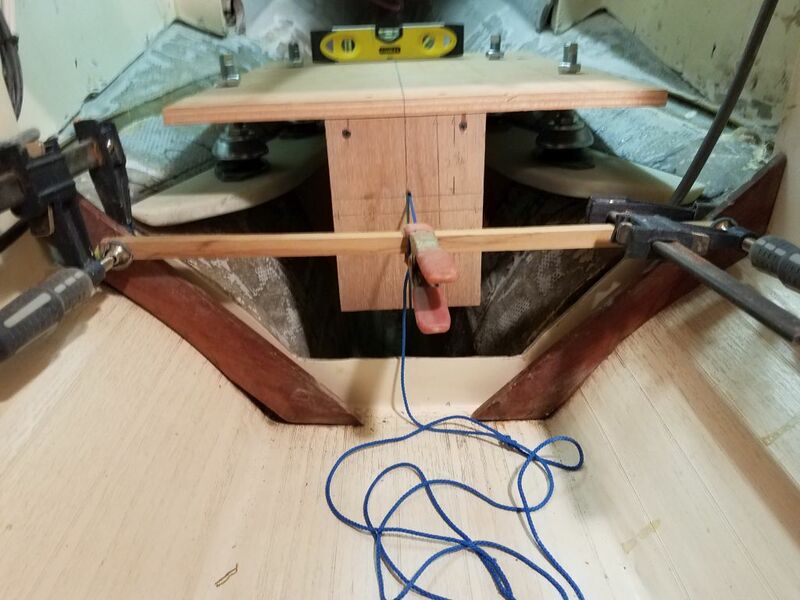 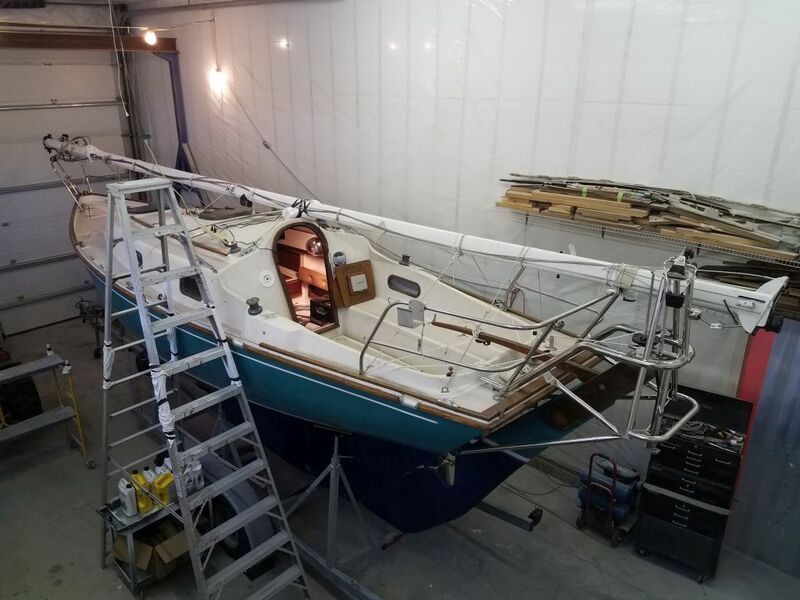 Once all the glue set up the arrangement was quite rigid, and I removed the top cross braces and levels to clear the way for the next step, which was to replace the engine template and shaft string to check, once more, that the new foundations were where they needed to be. 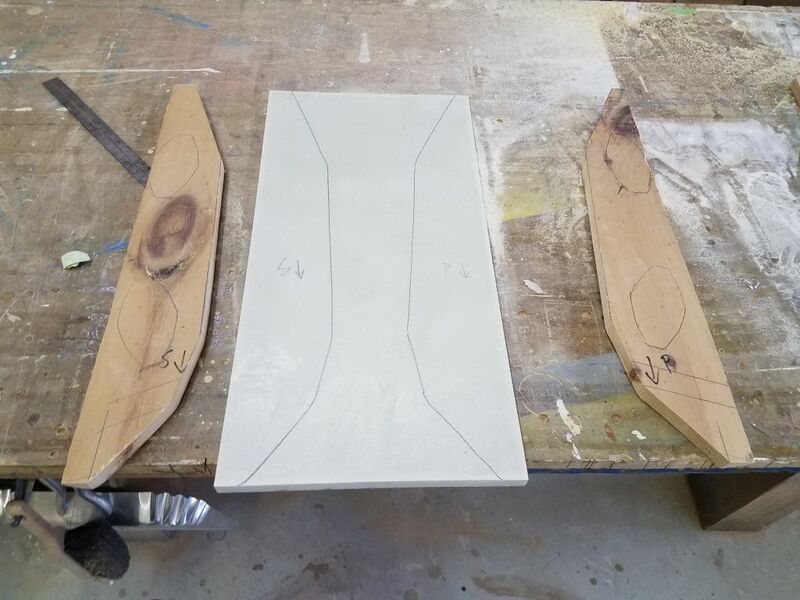 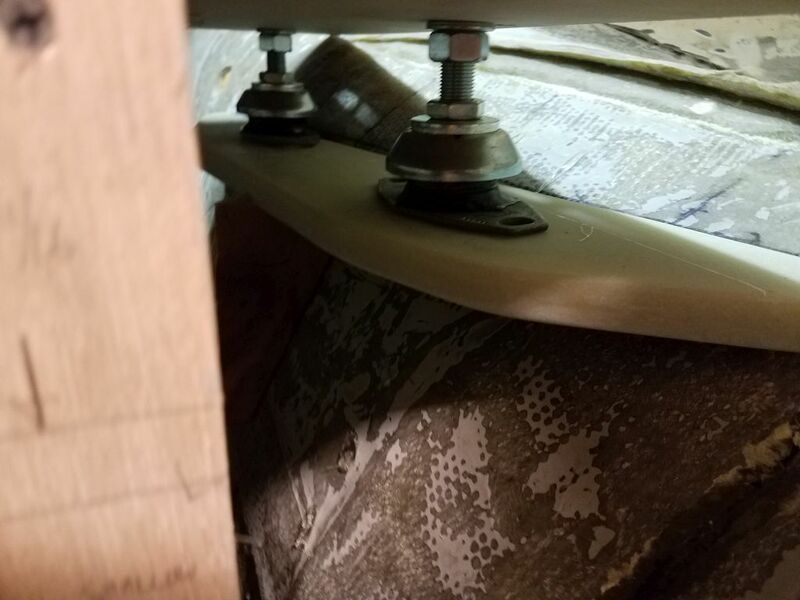 Keeping in mind that the platforms were about 1/4″ lower than their final designed height, I confirmed that the position and basic alignment was in keeping with expectations. 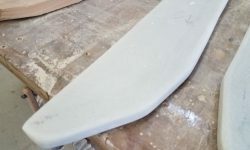 Finally, I applied epoxy fillets to the top edges to secure the foundations permanently and fill small gaps at the edge. 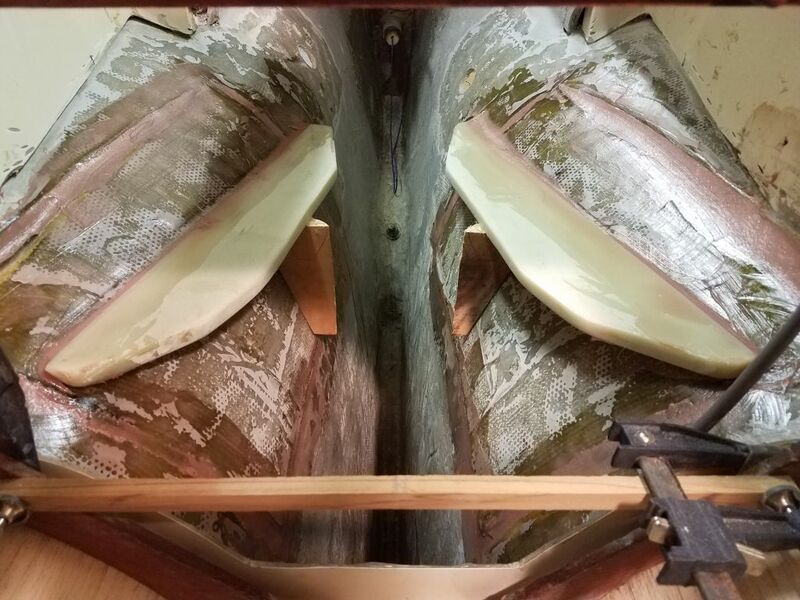 I chose to leave the underside of the platforms for later, once I could clear the braces beneath and improve access all around I used more of the epoxy to smooth out the slots leftover from the original foundations and otherwise prepare the overall area for fiberglass, which would be the next step.